, based on the eternal redemption obtained, and eternal life released to us, by Jesus Christ. Second Thessalonians 2:16: God our Father “loved us and given us eternal comfort and good hope in grace.” The love, comfort, and grace are for us now, and in the kingdom age, and eternally in New Jerusalem. Thank Him for His wonderful care for us. 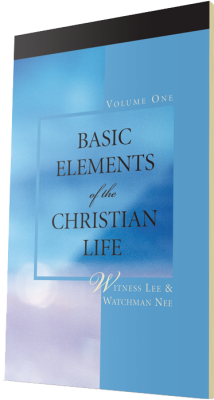 Hebrews 9:14 says, “How much more will the blood of Christ, who through the eternal Spirit offered Himself without blemish to God, purify our conscience from dead works to serve the living God?” The eternal Spirit brings to us the conscience-purifying effect of Christ’s blood shed on the cross. And through this eternal Spirit we have the eternal life, the resurrection life, the life that characterizes the kingdom of God and New Jerusalem. 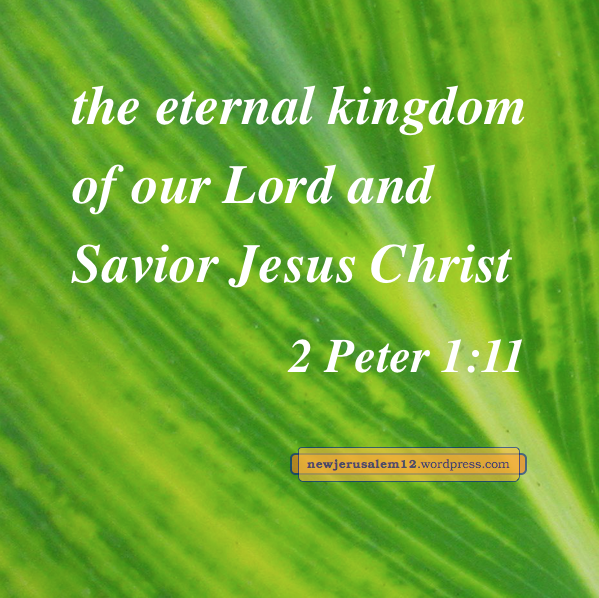 Second Peter 1:11 speaks about our “entrance into the eternal kingdom of our Lord and Savior Jesus Christ…” We are already in the spiritual reality of the kingdom, as seen in Romans 14:17, “the kingdom of God is…righteousness and peace and joy in the Holy Spirit.” This spiritual reality is ours now because of our new birth by the Spirit (John 3:5). Nevertheless, there is a fuller stage of the kingdom to come. By partaking of the divine nature (1 Peter 1:4) the divine virtues develop in us and give us the entrance into the manifestation of the kingdom and carry us onward to New Jerusalem. All of these eternal things are “according to the eternal purpose which He [God] made in Christ Jesus our Lord” (Eph. 3:11). 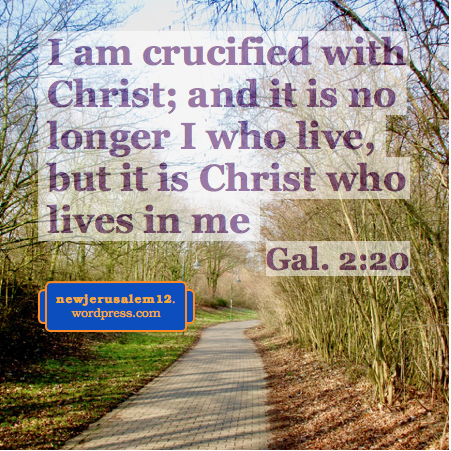 God’s purpose is eternal and consummates in eternal New Jerusalem. God’s purpose is far higher than our sinful condition, far higher than overcoming evils on earth. His purpose takes care of these negatives but much more brings forth New Jerusalem with the glory of God radiating through all God’s people. The devil has no part in New Jerusalem nor in the entire new creation because he has been cast into the lake of fire (Rev. 20:10). The devil is the father of lies, the source of lies is his nature, and in him is only falsehood, no reality (John 8:44). This is a total contrast to Jesus Christ who is the reality (John 14:6), the expression of God who cannot lie (Titus 1:2). The truth has come to us in word of the truth of the gospel (Eph. 1:13, Col. 1:5). 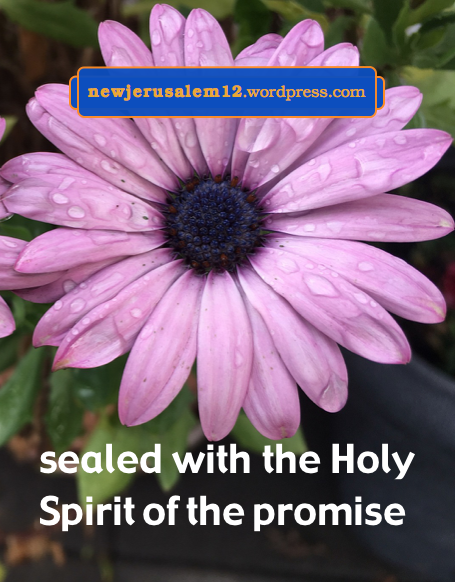 By our receiving this word of truth, the Spirit as the anointing entered into us. 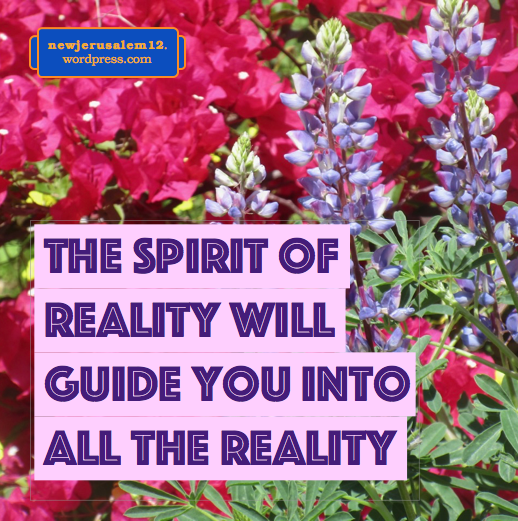 Now the Spirit of reality is living in us, anointing us with the reality. 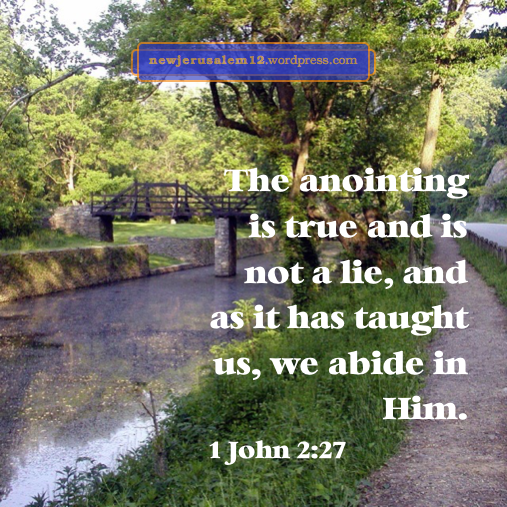 This anointing “is true and is not a lie, and even as it has taught you, abide in Him” (1 John 2:27). When we abide in the Lord, we abide in the reality, the truth; here there is no lie, no falsehood. This is a foretaste of New Jerusalem. In Revelation 14:1-5, 144,000 are on the heavenly mount Zion with the Lamb. Verse 5: “And in their mouth no lie was found; they are without blemish.” “No lie” indicates nothing of the devil is with them. 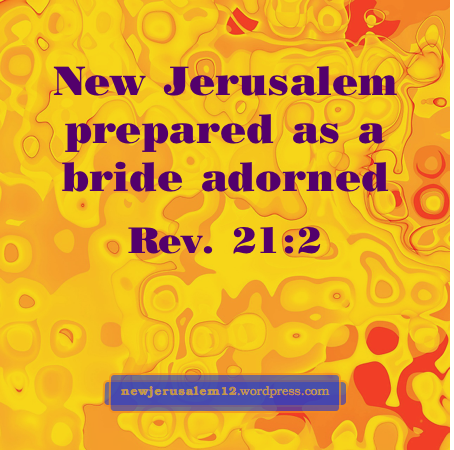 The holiness matches the holy city, New Jerusalem. The city is not merely without lies, falsehoods, and blemishes. 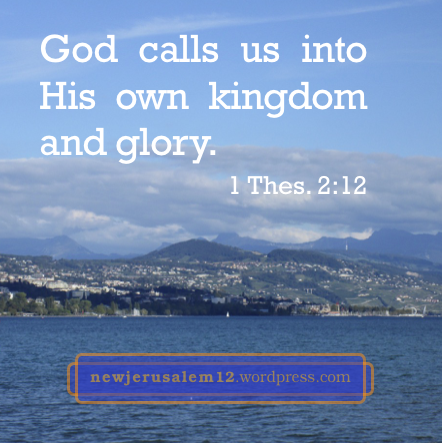 Much more, New Jerusalem is saturated with God’s holiness and glory to express God. 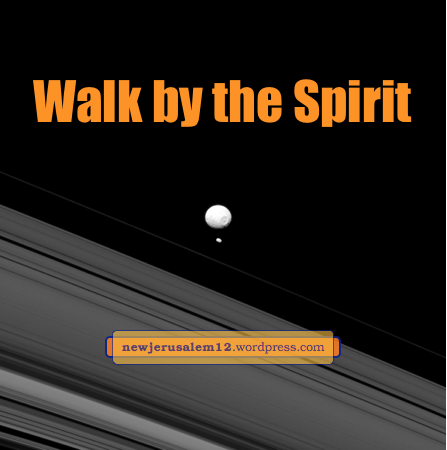 We need to be “carried away in spirit onto a great and high mountain” to see New Jerusalem (Rev. 21:9-10). But how do we get in position to be carried away? In Exodus 19 Israel came to Mt. Sinai where they received the vision of the tabernacle. When the tabernacle was completed, God’s glory filled it (Exo. 40:33-34), making it a picture of New Jerusalem as the eternal tabernacle of God filled with glory (Rev. 21:3, 11). 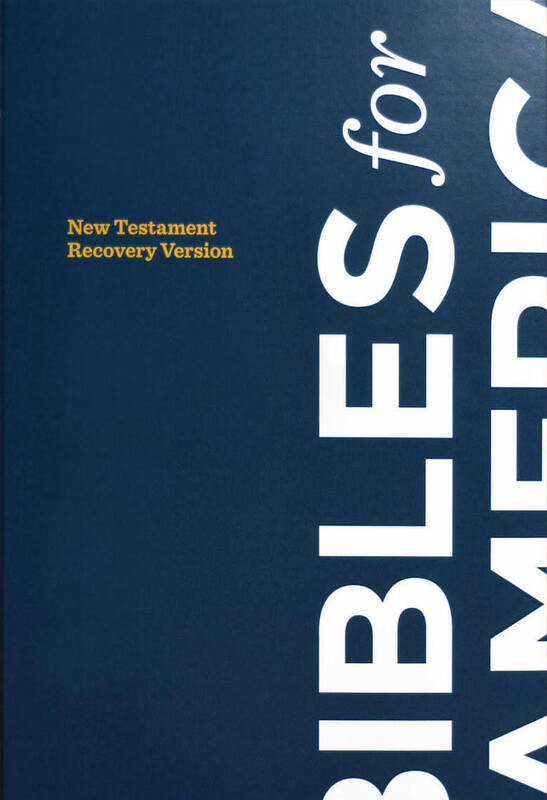 First Corinthians 10:1-13 reviews some of Israel’s journey in the wilderness and says that “these things occurred as examples to us.” Their journey to Mt. Sinai pictures our journey to a high spiritual mountain where we can see New Jerusalem. The first step in Israel’s journey was the redemption portrayed by the Passover. We need to repent and ask the Lord to forgive all our sins. He has already accomplished redemption by dying; when we ask Him, redemption is applied to us as forgiveness. The second step in Israel’s journey was to eat the Passover lamb and the unleavened bread. This is a picture of our being nourished with Christ as the real Lamb and real Bread. This energizes us to walk out of Egypt. The next step for Israel was to cross the Red Sea, which portrays our baptism. This separates us from the world and destroys the worldly forces (Pharaoh’s army being buried in the Red Sea). First Corinthians tells us that this baptism is not only in water but also in the Spirit. Water is the visible symbol but it alone is not effective. We need the invisible reality of the Spirit’s baptism. These three steps begin our Christian journey to the mountain to see New Jerusalem.